The fall is sore throat season. As the temperature starts to drop it is easy to catch a bit of a cold and develop discomfort in the throat that makes it painful to swallow, breath in deeply, and in some cases, even speak. If left untreated, a sore throat can quickly develop into a debilitating illness that requires antibiotics and medical treatment to cure. However, most of the time it’s possible to note early symptoms and catch the onset of a sore throat before it becomes debilitating. Tickling in the throat or a slight discomfort when swallowing are signs that you are developing a sore throat, and it is at this stage that natural treatment is easy to apply and also most effective in preventing a serious sore throat from developing. The Throat Saver. The Throat Saver is an anti-bacterial spray made from a mixture of natural ingredients that will promote a healthy and strong immune system for fending off colds, coughs and sore throats. The spray works by neutralizing excessive mucus accumulated from post nasal drip or other symptoms, ensuring there is no opportunity for bacteria to fester. Gargle with Saltwater. An age-old preventative measure is to gargle with salt water. If you feel even the slightest itch in the throat, gargling is a good idea. The hotter and saltier the water is, the more effective the liquid will be at soothing the inflamed glands in the throat. Honey. If gargling with salt water seems like overkill, then swallowing a spoonful of honey should do the trick. 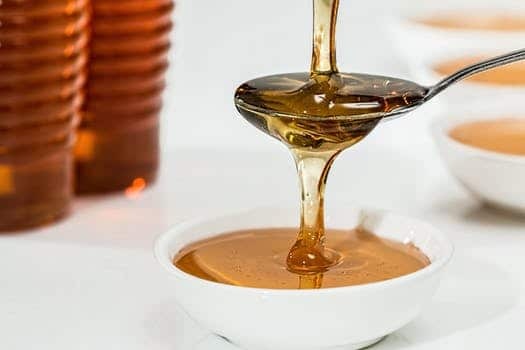 Honey will coat the lining of the throat and combat the inflammation or irritation before it gets too painful. You should find that your vocal cords are more relaxed and smooth – just like the consistency of honey. Herbal Tea. Teas like chamomile and peppermint work wonders on the throat. Both have soothing, anti-inflammatory properties for reducing pain when swallowing or talking. Apple Cider Vinegar. A shot of apple cider vinegar is a great way to start the morning, even if you don’t have a sore throat. The level of acidity in the liquid makes it ideal for suppressing and preventing bacterial build-up, which is one of the two ways in which sore throats develop (the other being from a viral source, like a cold). Argentum Nitricum Spray. Argentum Nitricum is a natural anti-bacterial agent, which, unlike prescription antibiotics, does not create immunity in the organisms it kills. This means it will deal with a sore throat the same way every single time, without exposing the immune system to a greater likelihood of illness in the process. The Argentum Nitricum spray is easy to apply and goes to work right away for all manner of upper-respiratory symptoms. This season, keep a sore throat at bay with these natural remedies. Contact Sloan Natural Health Center for more information today.